Sun Pier House is a creative centre turning old offices into an artistic hub, located at the historic Sun Pier, Chatham. Within the building, there is a large exhibition gallery, tearoom, events space, hire rooms, artist studios, and open plan creative office, all enjoying a glorious panoramic view of the River Medway. Sun Pier House CIC was formed to support and promote the best of Medway’s talent, providing a base for established and start-up businesses in the creative sector. Sun Pier House CIC actively promotes the businesses working within our creative community, encouraging them to grow and develop to their full potential. INTRA is an arts venue offering creative facilities with a programme of events, courses and workshops. It welcomes people of all ages, abilities and circumstances. INTRA includes the Medway Fine Printmakers print studio, equipped for intaglio, silkscreen, relief printing, letterpress and textile printing. Open access days are available for experienced printmakers to use the workspace and presses. Community craft drop-in Unravel & Unwind offers a homely centre at INTRA where you can learn knitting, sewing, crochet, drawing and many other creative skills. You can come along to share your own tips and work on projects in good company. 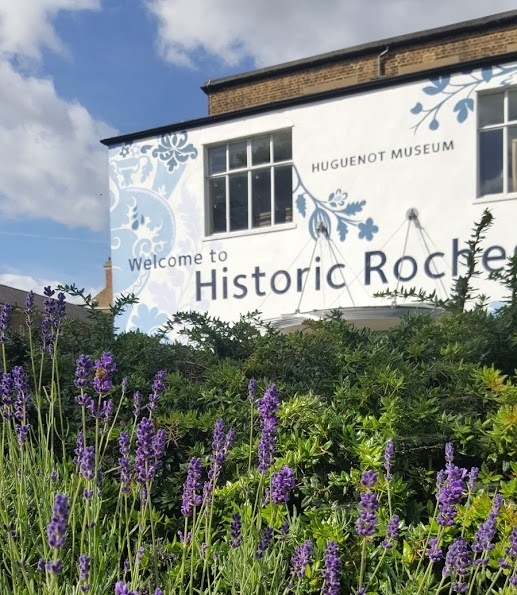 The Huguenot Museum runs a diverse and creative programme of events, workshops run by a range of dynamic artists, as well as a talks programme highlighting both historic and contemporary history, design, literature and more. With regular story time sessions for under 5’s and family activities running in the holidays, the museum encourages families to try something new and explore history with a twist.